Hoping someone can help me with a shed problem on my Jane. I purchased my loom and stand used. The loom is in excellent condition overall, and has the upgraded rollers. 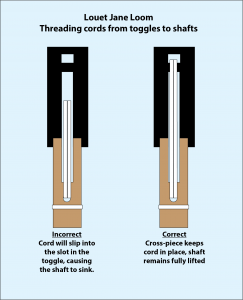 My problem is related to the lifting action of the toggles. It’s wonderful when a fellow weaver and solve their problem and let us know how they did – so we can share! Thank you, Rissa. While waiting for a reply from Louet, I went online and found good photos of the setup process. Turns out the previous owner had threaded the toggles to the shafts incorrectly. Here’s a photo to explain what went wrong and how I fixed it.